One of the best hostels I've stayed at. Great staff, super friendly and on a mission to show you the best time you can have in Prague. Special thanks to Heidi for taking great care of everyone staying at the hostel and making us all feel at home. Leo and Roberta where the greatest!!! Thanks to our perfect stay. Good hostel with nice staff, good bar, free dinner and good location! We had an amazing time at this hostel, definitely one of the best I have ever stayed at!! Free delicious meals every day, a nice living room to hang out in the end of the day and every night the bar was fun to go to. Amazing vibes, great place to meet new people and the staff was also super friendly, helpful with any questions and chill to hang out with. Jenna, Iva, Giovanni, Jess, Mot, Aly you were the best and made this a memorable stay, I cannot be more stoked about this hostel!! Ik sliep hier drie nachten samen met een vriendin tijdens onze reis door Europa. Het enige minpunt is de locatie, maar het is wel op loopafstand van het station en er zit een tramhalte vlakbij! Verder is het echt een super hostel, we werden heel vriendelijk ontvangen. We hadden een twee persoonskamer geboekt en dit was gewoon een klein appartement, echt super. Before we came to Prague everyone told us we should go to Hostel One Prague and now we understand why! The staff is lovely and is really helpfull. They try to get you to know a lot of people of the hostel. 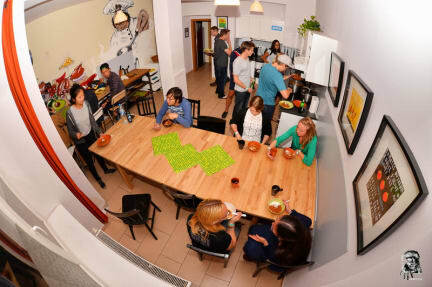 The hostel itself has a lot of facilities and activities, like a pub crawl or free dinner. The only thing I really had a problem with were the beds, even for a hostel standard they were extremely uncomfortable and made so much noise .